I really hate it when bloggers write "I've been a bad blogger!" Well -- I've been a bad blogger, but a good friend! I've been in Idaho helping a friend move, so the UFO Parade is late. 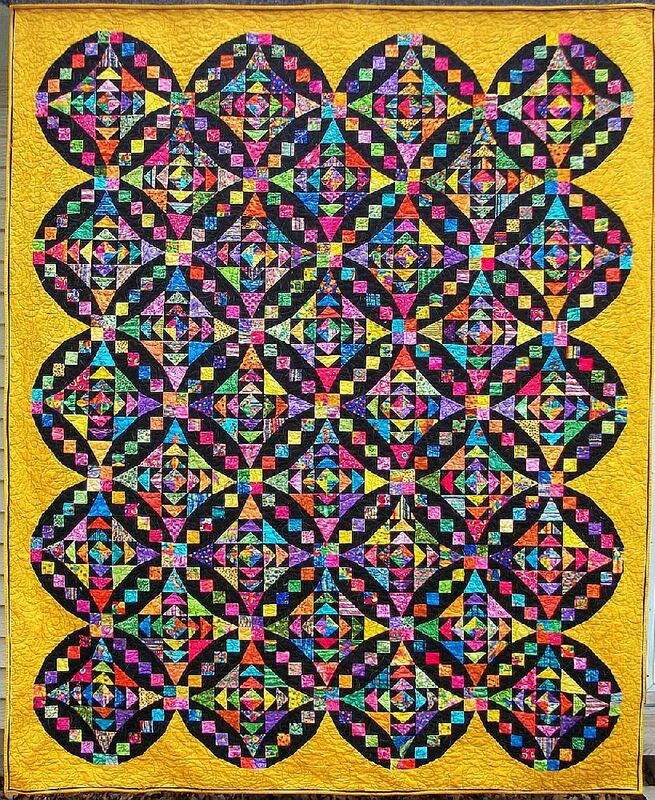 I finally got the borders on my Friendly Shoo Fly Block a Day from last summer. I morphed the blue blocks into a Friendship Star, because it was the same pieces, just a different location in the nine patch block. I also meant to make it smaller, but forgot when I started cutting and ended up with a King Size. 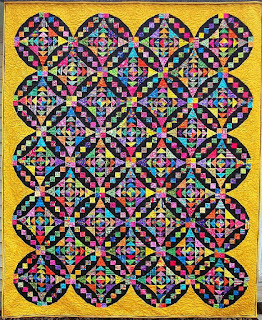 It's not quilted yet. 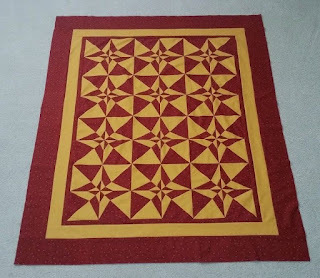 I haven't decided on a backing and whether to take it to my Mom's in TX to quilt on her long arm this summer or wrestle with it under my home machine. Joy is also looking for advice on backing -- any ideas? 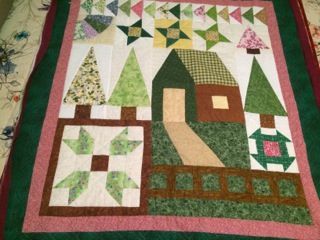 Sandi was not only quick to finish her May UFO -- she is ready for Christmas! I slipped into the 2015 UFO List that I created last December a few small projects to finish this year. I hoped that they would be selected during the months when my schedule was tight...and it did this month with #12. Tiny Treasurers is all too cute don't you think? 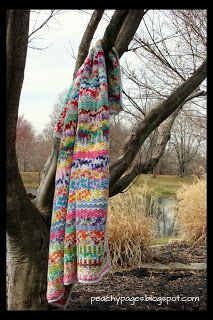 It is designed by Sandy Gervais (#582 Moda Candy Pattern). It is perfect to use for scraps since no piece is wider than 2 1/2". 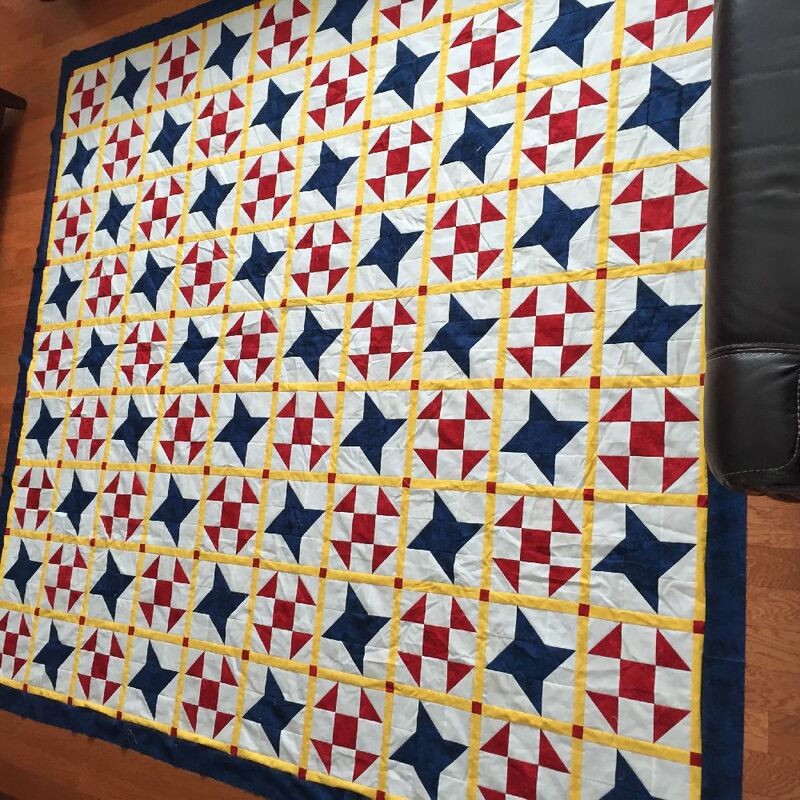 At only 16" x 16" total finished size it was easy to stitch up for a quick project. I have a second one on my sewing table already. I'm thinking these will be perfect gifts for any event. Thanks to one of my followers who came up with the PERFECT name Kringle's Kargo. 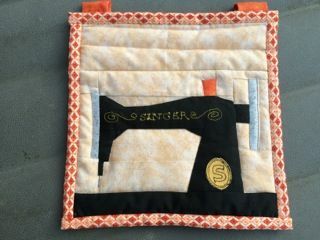 Pam's finish is a stunner -- and is that Susie's Magic Binding I spy on this beauty? It seems like it's been forever since I've had a finish. 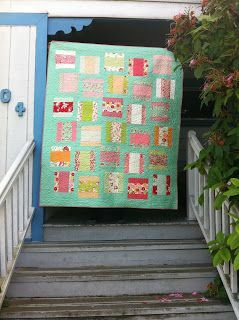 Last night (well,really early this morning) I finished up Eye Fooler - the quilt I made formy niece's graduation. Although I didn't start it until February, it's beenon my list to do since last fall. Pam has a second big finish! 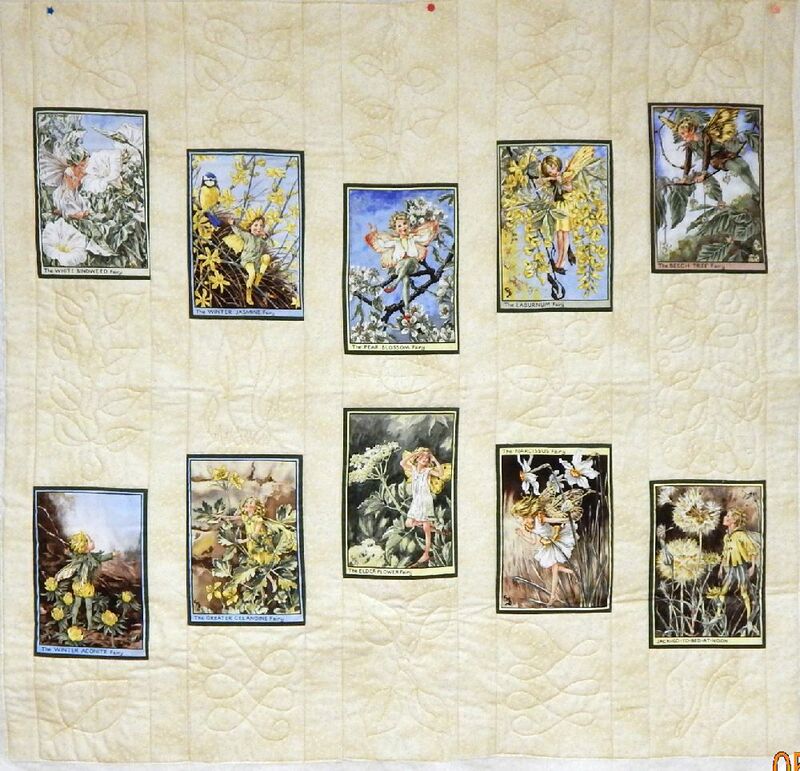 Here's the "story behind the quilt." This is Orca Bay – started in November 2011. I don’t like messing with strings and paper, so it got set aside. 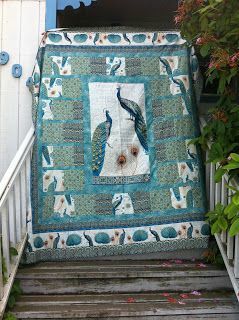 But as with nearly all of the quilts I’ve started, I knew eventually I would finish it. 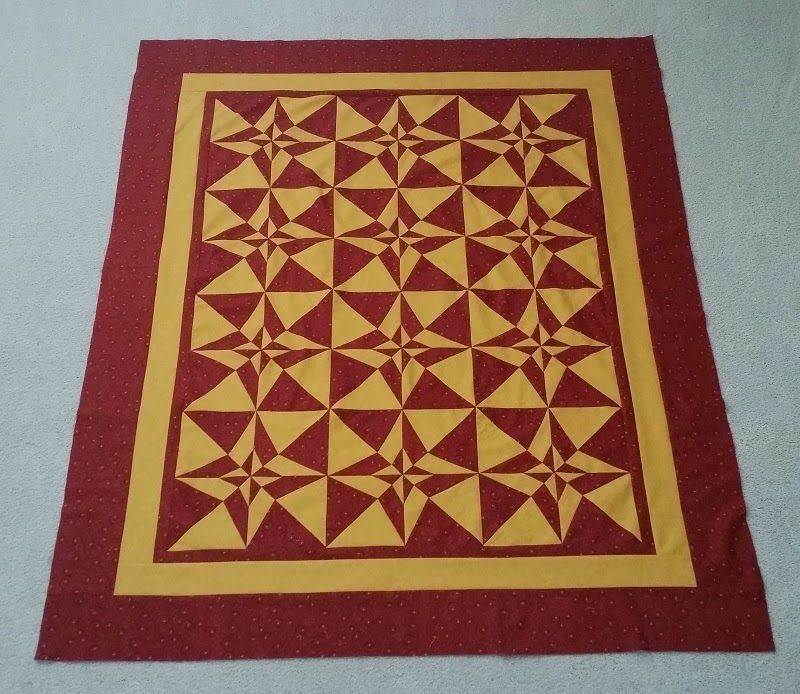 A friend asked me if I would make her a quilt. 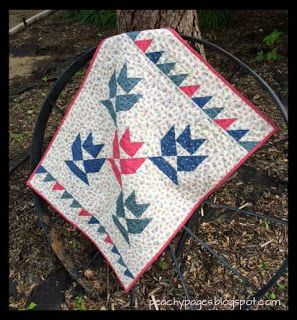 “orange” and “abstract” were my guidelines – so I showed her the Orca Bay blocks and my Orange Crush top - both Bonnie Hunter quilts. She picked Orca Bay with the understanding it could be 2016 before I got that far. 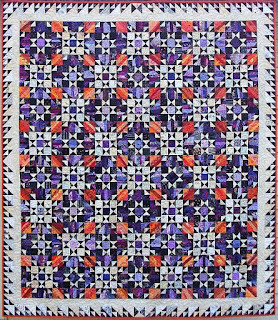 Butsince the quilt had a reason to be finished it was much easier to work on and I finished the top several months ago. 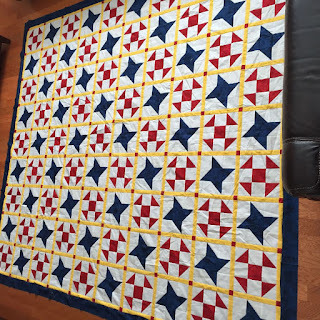 I finally got it quilted last week. I can't believe that it is the end of May. Where did it go? I did get my UFO finished early in the month, but then never took a picture until today. Nothing like a little procrastination in your life. This is one just because, I like the colors. No real plans but I am sure it will be with me for a while. It matches some pillows I have. I bought as a clearance kit a while back and I got all the way to the last border when I stopped working on it. 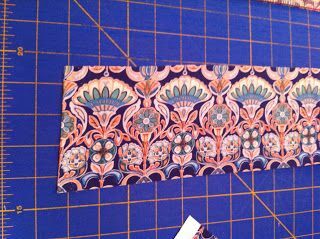 When I picked it up this month I remembered why - the outside border was to be cut width of fabric, fussy cutting the design. Of course the design was not printed straight. 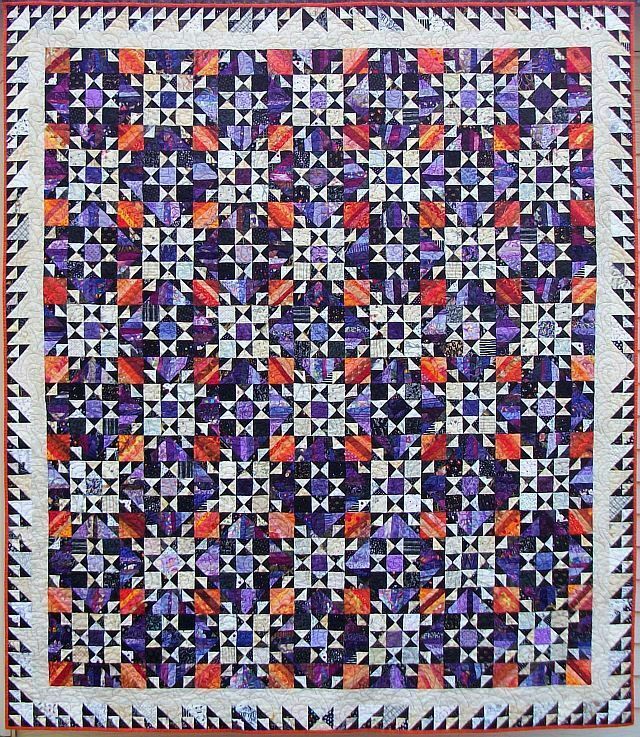 Can you say waves in this border? 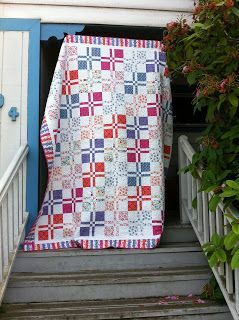 Nancy bound two other quilts during May -- love the Kate Spain fabrics in this first one! Irene also has two "finally finishes" for May. The first is a wall hanging I made for my mother when I saw this free pattern online. She worked at Singer Sewing in St. Louis when she graduated from high school. 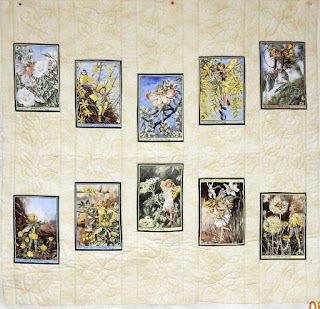 The second one is the final quilt in my wall hanging series for the four seasons. I think this was in my packages for UFOs in 2013 and it is FINALLY done. There are more details on my blog - another “finally updated” project. Kerry's May finish looks complicated -- but she claims it is not! 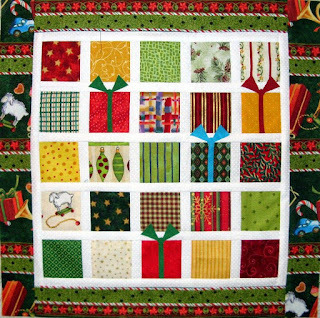 Mary's May finish is a donation quilt for the Ronald McDonald House. Isn't is sweet? Looking at my notes, I realize I failed to choose a winner for lat month's UFO Parade. So there are two this month! Nancy and Pam, please email me your postal addresses so I can send you a goodie! I'll be spending the summer in Texas, so no quilting for me -- I'm sewing summer clothes! What wonderful finishes for the month!!! A great roll up - even if a little late!! Love Kringle's Kargo - but the detail in Eye Fooler and Orca bay is mind boggling!! well done to everyone.